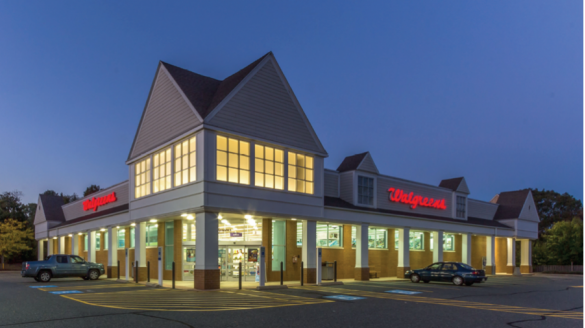 For sale to qualified investors is an opportunity to own a NNN Walgreen sFor sale to qualified investors is an opportunity to own a NNN Walgreens located in Medway, Massachusetts. Walgreens commenced rent in September of 2004, and has approximately 14 years of guaranteed lease term remaining prior to entering option periods. The property isbeing transferred with a long-term underlying ground lease in place,which has options and rental increases commensurate with the Walgreens lease itself. Both leases have approximately 59 years of term remaining of their 70-year initial terms. Additionally, the property includes potential assumption of a fully-amortizing loan with currentbalance of $2,365,000 and maturity of August 2029, allowing an investor to capitalize on a low 4.17% fixed interest rate and rapidly payoff all remaining principal over the base term of the lease. The property is located on heavily-trafficked Main Street in the center of Medway,directly across from Medway Commons, which includes Star Market(Albertsons Companies), McDonald’s, Starbucks, CVS, GNC, etc. Othertenants in close proximity include Verizon, Dunkin Donuts and Bank of America, and just a few miles west at the interchange with Interstate 495 are Whole Foods, Barnes & Noble, Walmart, Old Navy, Petsmart,Toys R Us, Michael’s, Staples, and others.